This is a perfect Men’s Watch having Perpetual Calendar. It has masculine design with Brown Genuine Leather Strap. The case is made of Solid Titanium. The dial of this was is black in color and having chrono sub dials. The case is protected with Non-Reflective Mineral Glass. With this mineral glass you will feel that you can even touch the hands of the watch. 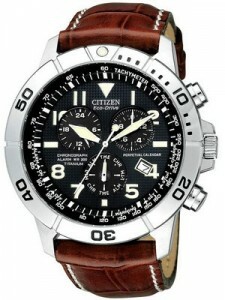 This Citizen Calendar Watch has Eco-Drive Movement which gets charged with the sunlight or any other source of light. It can save the power and has Low Charge Indicator. This Ecodrive has good power reserve of about 270 Days. You can set the alarms for your perfect schedule. The dark blue dial has bright and Luminous hands and markers which improves its readability. 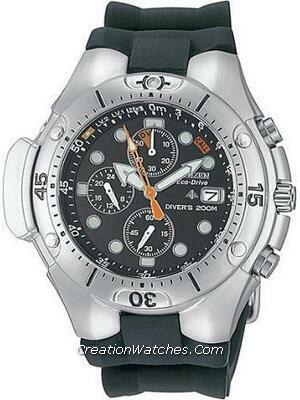 This Citizen Chronograph Eco is equipped with Tachymeter on inner bezel and Rotating bezel over the case. The Perpetual calendar is automatically adjusted for odd and even months and leap years through 2100.The chronograph of this watch can measure up to 60 minutes 12/24 hour time. 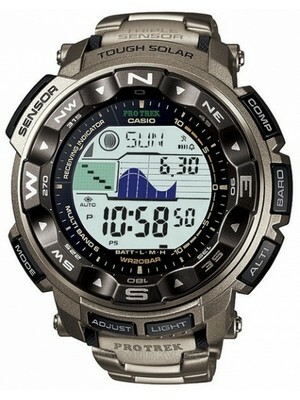 This Mens Perpetual Calendar Watch has the water resistant of 200 Meter. Very dark blue dial (almost black) with white hands and markers. Anti-glare scratch resistant mineral crystal. This watch is available for US $245.00 with us.